Album baru Coldplay 'A Head Full Of Dreams' memang baru akan dirilis pada 4 Desember mendatang. Tapi proses pre-order dari 'A Head Full Of Dreams' sudah dimulai sejak sekarang. Bahkan meski baru masuk proses pre-order 'A Head Full Of Dreams' sudah sukses memuncaki chart iTunes di beberapa belahan dunia. Salah satunya adalah Indonesia. Grup band pelantun 'Paradise' itu pun seperti tak menyangka dengan hal tersebut. Lewat akun Twitter-nya, mereka mengucapkan terima kasih sambil mem-posting negara-negara yang albumnya sukses memuncaki chart iTunes dan tentunya Indonesia. 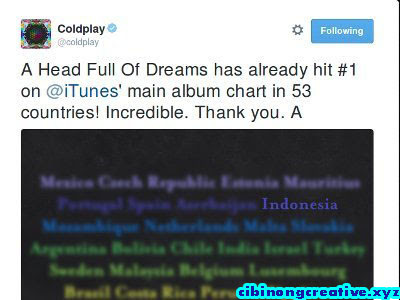 "A Head Full Of Dreams has already hit #1 on @iTunes' main album chart in 53 countries! Incredible. Thank you. A," kicaunya. Sebelum merilis 'A Head Full Of Dreams', Coldplay sedikit pemanasan terlebih dahulu. Mereka merilis lagu baru berjudul 'Adventure Of A Lifetime'. Sang vokalis sekaligus pencipta 'Adventure Of A Lifetime', Chris Martin menyebut lagu tersebut terinspirasi dari hits Guns N' Roses. Hits tersebut adalah 'Sweet Child O' Mine'. Coldplay's new album 'A Head Full Of Dreams' is to be released on 4 December. But the process of pre-orders from 'A Head Full Of Dreams' has been started now. Even though only pre-order entry process 'A Head Full Of Dreams' has been successfully topped the iTunes charts in several parts of the world. One of them is Indonesia. Band singer of 'Paradise' it was like did not think with it. Through his Twitter account, they say thank you while posting the countries that album topped the iTunes chart success and of course Indonesia. "A Head Full Of Dreams has already hit # 1 oniTunes' main album chart in 53 countries! Incredible. Thank you. A" he said. Before the release of 'A Head Full Of Dreams', Coldplay little warm up first. They released a new song titled 'Adventure Of A Lifetime'. The vocalist and creator of 'Adventure Of A Lifetime', Chris Martin called the song is inspired by the hits of Guns N 'Roses. The hits are 'Sweet Child O' Mine '.